On the plains of Namibia, millions of tiny termites are building a mound of soil—an 8-foot-tall “lung” for their underground nest. During a year of construction, many termites will live and die, wind and rain will erode the structure, and yet the colony’s life-sustaining project will continue. Inspired by the termites’ resilience and collective intelligence, a team of computer scientists and engineers at the Harvard School of Engineering and Applied Sciences (SEAS) and theWyss Institute for Biologically Inspired Engineering at Harvard University has created an autonomous robotic construction crew. The system needs no supervisor, no eye in the sky, and no communication: just simple robots—any number of robots—that cooperate by modifying their environment. Harvard’s TERMES system demonstrates that collective systems of robots can build complex, three-dimensional structures without the need for any central command or prescribed roles. The results of the four-year project were presented this week at the AAAS 2014 Annual Meeting and published in the February 14 issue of Science. 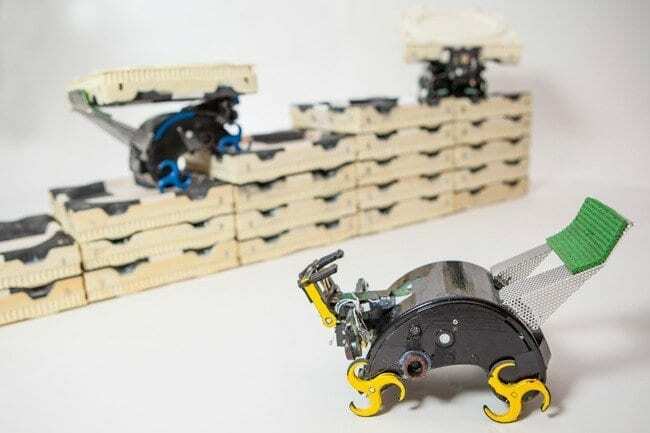 The TERMES robots can build towers, castles, and pyramids out of foam bricks, autonomously building themselves staircases to reach the higher levels and adding bricks wherever they are needed. In the future, similar robots could lay sandbags in advance of a flood, or perform simple construction tasks on Mars. “The key inspiration we took from termites is the idea that you can do something really complicated as a group, without a supervisor, and secondly that you can do it without everybody discussing explicitly what’s going on, but just by modifying the environment,” says principal investigator Radhika Nagpal, Fred Kavli Professor of Computer Science at Harvard SEAS. She is also a core faculty member at the Wyss Institute, where she co-leads the Bioinspired Robotics platform. Most human construction projects today are performed by trained workers in a hierarchical organization, explains lead author Justin Werfel, a staff scientist in bioinspired robotics at the Wyss Institute and a former SEAS postdoctoral fellow. Instead, termites rely on a concept known as stigmergy, a kind of implicit communication: they observe each others’ changes to the environment and act accordingly. That is what Nagpal’s team has designed the robots to do, with impressive results. Supplementary videos published with the Science paper show the robots cooperating to build several kinds of structures and even recovering from unexpected changes to the structures during construction. Each robot executes its building process in parallel with others, but without knowing who else is working at the same time. If one robot breaks, or has to leave, it does not affect the others. This also means that the same instructions can be executed by five robots or five hundred. The TERMES system is an important proof of concept for scalable, distributed artificial intelligence. Nagpal’s Self-Organizing Systems Research Group specializes in distributed algorithms that allow very large groups of robots to act as a colony. Close connections between Harvard’s computer scientists, electrical engineers, and biologists are key to her team’s success. They created a swarm of friendly Kilobots a few years ago and are contributing artificial intelligence expertise to the ongoing RoboBees project, in collaboration with Harvard faculty members Robert J. Wood and Gu-Yeon Wei. Coauthor Kirstin Petersen, a graduate student at Harvard SEAS with a fellowship from the Wyss Institute, spearheaded the design and construction of the TERMES robots and bricks. These robots can perform all the necessary tasks—carrying blocks, climbing the structure, attaching the blocks, and so on—with only four simple types of sensors and three actuators. March 22, 2019 - Bees Talk to Fish: A New Technology Enables Cross Species Communication Interesting EngineeringUsing robotic spies, natural ecosystems may be rewired to serve human interests. Will these biohybrid technologies allow the rewiring of ecosystems? December 19, 2018 - An autonomous robot swarm has self-organized by acting like natural cells MIT Technology ReviewHundreds of tiny robots have been made to work as a team, inspired by the biological principles of self-organization.